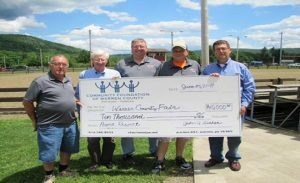 The Community Foundation of Warren County recently made a grant of $10,000 to the Warren County Fair for the construction of new bleachers and a permanent structure to cover the bleachers at the main show ring. The fairgrounds in Pittsfield has served the community for 50 years, playing host to numerous 4-H clubs, civic clubs, agricultural and recreational programs, and of course the Warren County Fair. The fairgrounds have always offered a safe environment for these activities; and John Ward, member of the Warren County Fair Board, wants to keep it that way. “We’ve talked about it for years,” said Ward. This year, to accommodate current programs and to support growth, The Fair Board made the decision to finally begin the renovation. The new, permanent structure will have a wood frame with steel sides and roof. It will include enough room to accommodate an additional 25 feet of bleacher seating in the future. In addition to the permanent structure, the Warren County Fair will also look to purchase equipment for irrigation and maintenance of the ring. The main ring is a focal point throughout fair week, offering events that are attended by thousands of people. The hope is that the renovation will provide added comfort and enjoyment for observers, as well as open new doors for the venue. The permanent structure will be useable in time for fair week, and additional funding will determine the advancement for 2018. Renovations are estimated to cost around $50,000 to complete. Currently, The Fair Board is still accepting donations towards the show ring roof project. Checks should be made out to the Warren County Fair with a memo line of “Roof Project,” and mailed to P.O. Box 230 Pittsfield, PA 16340.